On 15 April 1951, the Detachment officially changed their name and designation to 2450 Aircraft Control & Warning Unit (Reserve). 2450 AC&WU reported to the RCAF Reserve Group Montreal, as they did when a Detachment of 1 R&C Unit. On 1 November 1951, the Unit changed from Reserve to Auxiliary and on 1 December 1953, the unit changed to Squadron status. 1 October 1958, saw the Squadron reporting directly to Air Defence Command. The unit deployed to a number of locations including Chatham, New Brunswick, Ste. Foy, Quebec and RCAF Station St. Hubert. Narrative reports on the Pinetree Line web site confirm that 2450 AC&W Squadron was active at RCAF Station St. Sylvestre, QC during the years 1955 to 1957 inclusive, RCAF Station Mont Apica, QC during 1952 and 1953 as well as RCAF Station Lac St. Denis between 1953 and 1955 inclusive. The Regular Air Force AC&W Squadrons began testing and conversion to the SAGE system in the early Sixties which made the use of Auxiliary Force personnel no longer viable as they had been trained exclusively for the manual system. Therefore, 2450 AC&W Squadron was disbanded on 31 December 1961. Organization Order R2.0.9 - 12 June 1961. Historical Record - 1 June 1961 to 31 December 1961. Historical Record - 1 December 1960 to 31 May 1961. Historical Record - 1 June 1960 to 30 November 1960. Historical Record - 1 December 1959 to 31 May 1960. Historical Record - 1 June 1959 to 30 November 1959. Historical Record - 1 December 1958 to 31 May 1959. Organization Order R2.0.0.10 - 16 June 1958. Historical Record - 1 June 1958 to 30 November 1958. Historical Record - 1 December 1957 to 31 May 1958. Historical Record - 1 June 1957 to 30 November 1957. Organization Order R2.0.11.5 - 19 February 1957. Historical Record - 1 December 1956 to 31 May 1957. 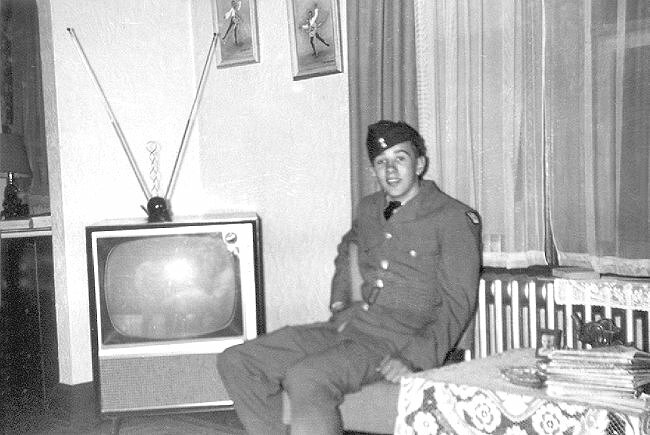 A very young Andy Andresen in the Sherbrooke Reserve Squadron - November 1956. Historical Record - 1 June 1956 to 30 November 1956. Historical Record - 1 December 1955 to 31 May 1956. Historical Record - 1 June 1955 to 30 November 1955. Organization Order R2.1.11.5 - 28 December 1954. Historical Record - 1 December 1954 to 31 May 1955. Historical Record - 1 June 1954 to 30 November 1954. Historical Record - 1 December 1953 to 31 May 1954. Organization Order 89/53 - 23 November 1953. Historical Record - 1 June 1953 to 31 October 1953. The Radar Echo newsletter - December 1952. Historical Record - 1 November 1952 to 31 May 1953. The Radar Echo newsletter - November 1952. The Radar Echo newsletter - September-October 1952. Historical Record - 1 June 1952 to 31 December 1952. 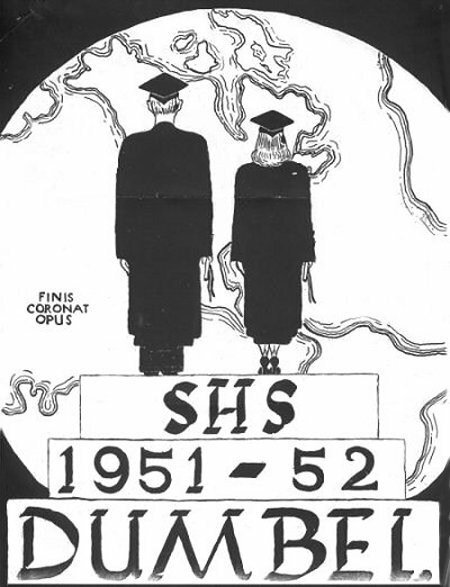 Front cover of 1951-1952 Sherbrooke High School Year Book - June 1952. 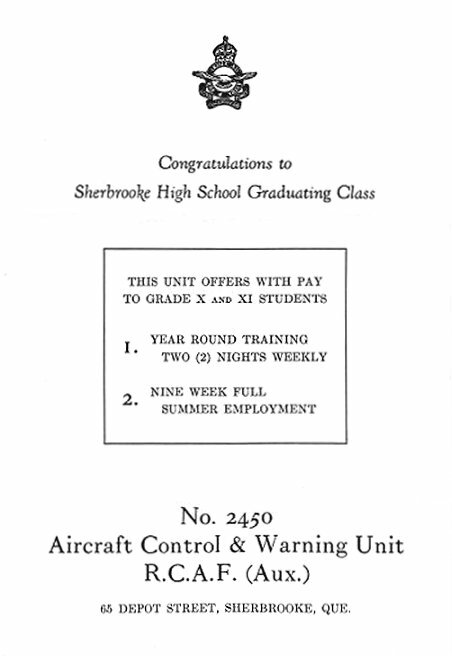 AC&W Squadron recruitment page in Sherbrooke High School Year Book - June 1952. Historical Record - 1 January 1952 to 31 May 1952. The Radar Echo newsletter - January 1952. Organization Order 22/51 - 3 April 1951. Historical Record - 1 December 1950 to 31 May 1951. Historical Record - September 1949 to September 1951.